11th lunar month of 1686: disciple of Kozakura Sennosuke I, he performs in Ôsaka as a wakaonnagata named Kozakura Kodayû in the troupe led by zamoto Araki Yojibê I performing in the theater managed by Ôsaka Tazaemon; his stage partners are Yamashita Hanzaemon I, Iwai Hanshirô I, Yamamura Kanzaburô, Sakurayama Rinnosuke I, Sodeoka Masanosuke II, Sakata Tôkurô, Takenaka Hanzaburô, Matsushima Han'ya II, Takigawa Kiyosaburô, Yoshikawa Genzaburô, Mihara Jûdayû I, Wakabayashi Shiroemon and Sadoshima Denpachi. 1st lunar month of 1687: he settles in Kyôto, where he takes the name of Kozakura Sennosuke II; he performs in the theater managed by the Murayama clan. End of the 1680s: he is adopted by Murayama Heiemon II and receives the name of Murayama Kuroemon. 1692: Murayama Kuroemon and his adoptive father Murayama Heiemon II respectively take the names of Murayama Heiemon III and Murayama Shichiroemon; the new Heiemon becomes also tachiyaku. 11th lunar month of 1693: Heiemon produces in Kyôto the drama "Hako Denju"; his stage partners are the Edo star Ichikawa Danjûrô I, Mizuki Tatsunosuke I, Yamatoya Jinbê II, Tomizawa Samanosuke, Otowa Katsunojô and Uemura Takenojô. 9th lunar month of 1694: Heiemon plays in the same theater the role of Iga Heinai Saemon in the drama "Kumagai Nagori no Sakazuki"; his stage partners are Ichikawa Danjûrô I (Kumagai Jirô Naozane), Mizuki Tatsunosuke I (Tomoe-no-Mae), Yamatoya Jinbê II (Taira no Tadanori), Sakata Tôkurô (Taira no Michimori), Iwai Hananojô (Michimori's wife), Onoe Taganojô I (Taira no Atsumori), Tomizawa Samanosuke (Kumagai's wife) and Uemura Takenojô (Kumagai's son). 1st lunar month of 1699: Heiemon goes to Edo to perform at the Moritaza. 11th lunar month of 1699: Heiemon plays at the Moritaza the role of Hosokawa Katsumoto in the drama "Tôsei Okuni Kabuki"; his stage partners are Ichikawa Danjûrô I, Miyazaki Denkichi and the Kamigata onnagata Ogino Sawanojô. 2nd lunar month of 1700: Heiemon goes back to Ôsaka to become zamoto. 2nd lunar month of 1701: Heiemon goes to Edo to perform at the Moritaza. 7th lunar month of 1701: Heiemon plays in the same theater the role of Tachibana Michiyoshi in Miyazaki Denkichi's drama "Sanze Dôjôji". 1702: Heiemon moves to the Ichimuraza. 1704: Heiemon moves to the Yamamuraza. 11th lunar month of 1706: Heiemon moves to the Nakamuraza and plays the role of Takiguchi in the kaomise drama "Uji Genji Yumihari-zuki", which welcomes in Edo the Kamigata actors Fujimura Handayû II and Yoshioka Motome II. 1st lunar month of 1707: Heiemon goes back to Kyôto to play the role of Gonshichi in the ni-no-kawari drama "Keisei Kiba no Ume", which is staged at Miyako Mandayû's theater. 7th lunar month of 1707: Heiemon plays in the same theater the role of Amibiki Hikosuke in Fukuoka Yagoshirô's bon kyôgen "Nyonin Ketsuen no Kanchô". Fall 1707: Heiemon goes to Edo. 11th lunar month of 1707: Heiemon plays at the Yamamuraza the role of Yukihira's karô Imaôji Tomoenojô in the kaomise drama "Yukihira Obana Gitsune". 1st lunar month of 1708: Heiemon's rank in the Edo hyôbanki, tachiyaku section, is jô-jô-(shiro)kichi (superior - superior - (white) excellent). 11th lunar month of 1709: Heiemon plays at the Yamamuraza the role of Akamatsu Mushanosuke in the kaomise drama "Taihei Okuni Kabuki", which celebrates the arrival in Edo of the Kamigata actors Asao Jûjirô, Arashi Sanjûrô I and Fujikawa Buzaemon I. 1st lunar month of 1710: Heiemon plays in the same theater the role of Tôkurô Morinaga in the new year program "Keisei Izu Nikki". 3rd lunar month of 1710: Heiemon's rank in the Edo hyôbanki, tachiyaku section, is jô-jô-(hanshiro)kichi (superior - superior - almost excellent). 9th lunar month of 1710: Heiemon plays in the same theater the role of Sasaki Moritsuna in the drama "Ômi Genji". 11th lunar month of 1710: Heiemon moves to the Nakamuraza and plays the role of Sagaminosuke in the kaomise drama "Shinsen Kazanin". 3rd lunar month of 1711: Heiemon's rank in the Edo hyôbanki, tachiyaku section, is jô-jô-kichi (superior - superior - excellent). He shares the same rank with Ikushima Shingorô, Nakajima Kanzaemon I and Nakamura Denkurô I. 11th lunar month of 1711: Heiemon plays at the Nakamuraza the role of Sano Tsuneyo in the kaomise drama "Mitsu Uroko Katoku Biraki". 11th lunar month of 1713: Heiemon moves to the Moritaza and plays the role of Takiguchi in the kaomise drama "Yorimasa Taikyoku no Mato". 11th lunar month of 1714: Heiemon plays at the Moritaza the role of Wada Saemon Tamemune in the kaomise drama "Onna Ryûko Futatsu Gashira". 11th lunar month of 1715: Heiemon moves to the Ichimuraza and plays the role of Sano Genzaemon in the kaomise drama "Banzei Onna Hachinoki". 11th lunar month of 1716: Heiemon performs at the Ichimuraza in the kaomise drama "Yoroi Kurabe Ôshû Gane". 11th lunar month of 1717: Heiemon appears on stage for the last time, at the Ichimuraza where he plays the role of Abe no Sadatô in the kaomise drama "Kinkazan Yoroi Biraki". 5th day of the 6th lunar month of 1718: Heiemon dies in Edo. Born and trained in Kamigata, Murayama Heiemon III was the heir of an important family of actors and theater managers. 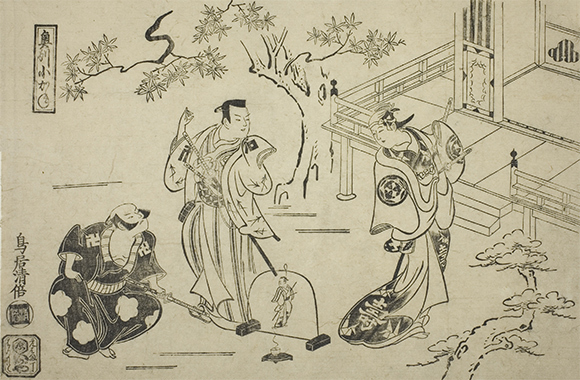 He achieved fame for himself in Edo, where he performed in the 4 major theaters from 1699 to 1718. During his short stay in Kyôto in 1707, he had the opportunity to meet and to watch on stage the star Sakata Tôjûrô I; this had a beneficial influence on his acting. He became one of the best Edo tachiyaku actors and an outstanding jitsugotoshi.